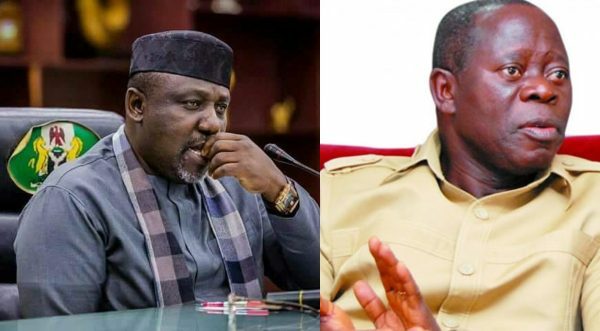 The Governor of Imo State, Rochas Okorocha who spoke with state house correspondents after his meeting with President Buhari yesterday, November 1st has stated that Adams Oshiomhole’s high-handedness is destroying the party which he is chairman of. According to Rochas Okorocha who has been at loggerheads with Oshiomhole after the party’s governorship primary in Imo in which his son in-law, Uche Nwosu was declared winner was annulled by the party’s National Working Committee NWC, the way the former Edo State Governor is managing the affairs of the party has led to APC losing over 5 million of its members, and also destroying the party. “Oshiomole is on his own in this whole thing. There is no presidency’s support for him to refuse candidate, those who won elections, and give wrong candidates who didn’t win election. This is the matter and I will simply say that he does not have consent of the presidency; he is on his own. “I also request that Oshiomole must learn to respect the rule of law and obey court orders where they apply. This issue of treating court orders as tissue papers must stop; it doesn’t reflect the image of our party. He must act quickly to fix the integrity of this party because his coming in ought to have brought joy into the party and not sadness. “The party is still intact, just that many people are hurt. Since his inception and after the primaries, we have lost almost five million voters. There is anger, protest everywhere. He needs to be called to order; he has to respect the rule of law, respect court orders and do the right thing – obey court orders where applicable and not turned himself into INEC” he said. The post “Oshiomhole’s High-handedness Is Destroying APC” – Okorocha appeared first on LATEST NIGERIAN NEWS BREAKING HEADLINES NEWSPAPERS.